Brenda was looking forward to showing at Second Level. She had taught her horse all the "tricks" that a Second Level horse should know. To her surprise, the judge didn't agree. She received a very low score, and the judge's comments were full of terms she didn't really understand. What did the judge mean by "lack of impulsion", "needs more uphill carriage", and "insufficient collection"? Many people watch a 2nd Level dressage test and come away thinking it is all about teaching the horse fancy tricks. It isn't. The "fancy tricks" that they see the horse performing are actually movements designed to reshape and condition a horse's body and improve his way of going. A horse will score poorly if he trails his haunches and pulls himself along with his front legs while performing shoulder-in or travers rather than carrying more weight in his hindquarters and driving the movement from his powerful haunches. ​The secret: Second level riders typically lose points for insufficient collection and lack of clarity in transitions. Collection is introduced at Second Level, which means that the horse is now expected to carry more weight in his hindquarters. This gives him a more "uphill" carriage. This is usually the first thing people notice about the horses at this level. Their necks are more arched, their head carriage is higher, their bodies appear "shorter" from poll to croup, and their hind legs appear to be more "under the belly." Before we get to how to improve your scores, let's see what a great Second Level Test looks like. I've chosen a YouTube video of a lovely horse-rider pair who execute their Second Level Test with ease, harmony, and clarity of movements. Notice that the horse is NOT a big warmblood with flashy movement who has been bred for the sport. I've done this on purpose because Training through 2nd Level dressage can be used to improve any horse's strength, agility, and way of going. Your horse can do this, no matter what age or breed. Now for the nitty-gritty details that can win you or cost you major points. 1. IMPROVE YOUR HORSE'S STRENGTH AND ENDURANCE BY SCHOOLING COLLECTION IN LONGER SEGMENTS. In the new 2015 tests, the distances for the lengthened and medium trot and canter movements were reduced at 1st level to make it easier for the horse to keep a more uphill balance and steady tempo. But at Second Level, the horse is expected to be balanced and strong enough to perform a full diagonal or long side of the movements. Including shoulder-in and travers in your training routine is an excellent way of improving your horse's strength, agility, and collection. More on how to ride shoulder-in can be found here. More on travers can be found here. And more about how these movements improve collection can be found here. 2. PERFECT YOUR HALF-HALT SO YOU CAN IMPROVE YOUR HORSE'S COLLECTION. Second Level Directives now include the words “engagement” and “uphill balance.” This means that it is essential that your horse's hindquarters are weighted and active in every movement. The way to shift your horse's weight back onto the haunches is through the half-halt. Do not guess at how to do this. It is the cornerstone of every collective movement, and if you are not clear about how to perform an effective half-halt, every single movement you ride from here on out will be poorly executed. The canter and trot that brought you big scores at First Level will bring you mediocre scores at Second Level because the judge expects to see more collection and brilliance in your horse's gaits. More on how to perform the perfect half-halt here. More about how to execute an effective half-halt here. SERPENTINES: Serpentines MUST be three smoothly connected 10-meter half-circles. The problem is that even at second level, many riders still don't have a clear image in their minds of the geometry of the arena. As a result, their serpentines end up being asymmetrical. 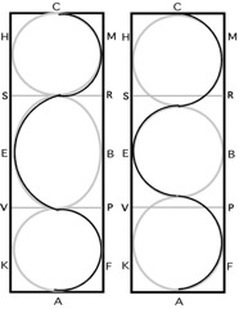 Often, riders here are still using RSVP in the middle of the dressage arena as guides, so the middle half-circle in their serpentines are enormous while the top and bottom half-circles are tiny. 4. CLEAR TRANSITIONS, HALTS, AND REIN BACKS. Judges look for clarity in these things. When you transition from medium trot (or canter) to collected trot (or canter), the change should be immediate and clear. The same goes for transitions from medium to extended trot or canter. This means your horse has to be attentive to your aids. Practice these transitions until your horse clearly understands what your aids means—what you are asking for. And ALWAYS prepare your horse for the transition by doing a half-halt. The half-halt means "Pay attention, something is going to happen now." It produces the collection you need for the collected gaits, and gathers up power in the haunches that you release to produce a brilliant extension. When performing rein back, make sure that you come to a complete halt and that your horse is balanced. Then squeeze your hands gently while you apply pressure with both legs to ask your horse to step back. Make sure your horse takes 3-4 CLEAR steps back, halt, then resume the test. 5. TURN ON THE HAUNCHES: When doing turn on the haunches, your horse’s hind legs can travel on a 1-meter circle. More than that and it’s a turn around the middle, not haunches; less than that and it’s a pirouette. Be sure to begin the turn before the letter. 6. DRAW YOUR TESTS. There are many movements in Second Level tests, and little time to think about them. That means you must have them memorized and visualized. You must have a mental diagram of the arena in your mind with the transitions clearly marked and the span of the circles, serpentines, and half circles accurately represented. In a 2010 Dressage Today article, Hilary Moore, FEI competitor, and USDF associate instructor stressed the importance of DRAWING your dressage tests, especially at the lower levels. "Draw your test movements", she states, "so that you know what each should look like, including the exact geometry of the arena. You need to know exactly where your figures hit each point." ​The 2015 USEF Dressage Tests can be found here.